It’s really easy to build your own worm farm, and it only takes a few minutes to build one. 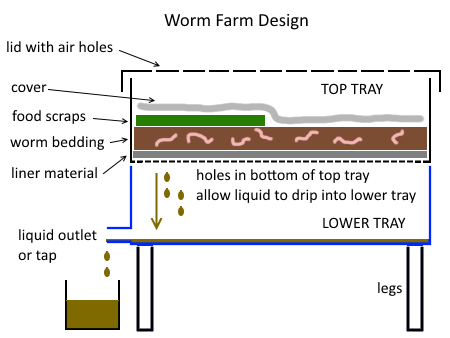 Here’s the basic design of how the worm farm is put together and how it works. Take two polystyrene foam broccoli boxes with lids, put one lid aside as you’ll only need one lid. 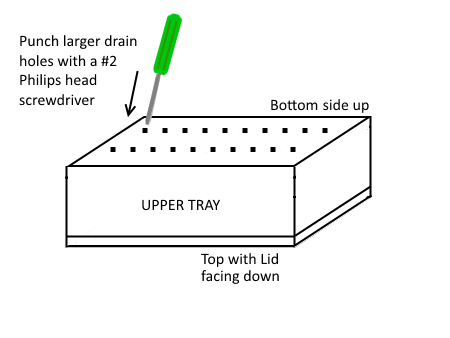 Take one box for the upper tray, and using the #2 Philips head screwdriver, punch a two row of drain holes in the bottom. Punch the holes from the outside of the box to the inside, so they’ll appear neater on the outside, as the foam breaks out a bit and looks messier on the exit side the screwdriver hole. 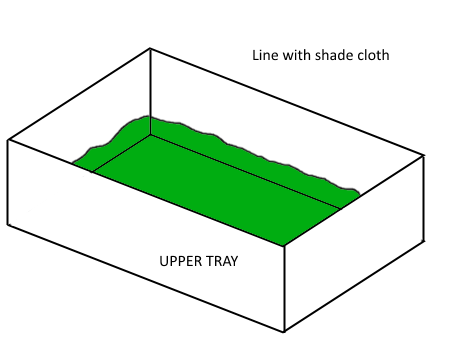 Cut a piece of shade cloth which is both wider and longer than the inside of the upper tray foam box, and place it in the bottom, so it runs up the sides. This will prevent the bedding and worms falling through the drain holes. 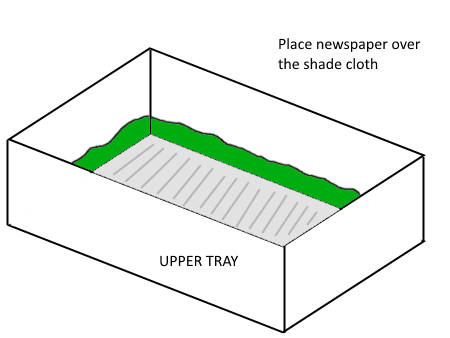 Take a few whole newspapers and sit them over the shade cloth, fold and overlap them to neatly fit the bottom of the upper tray foam box. 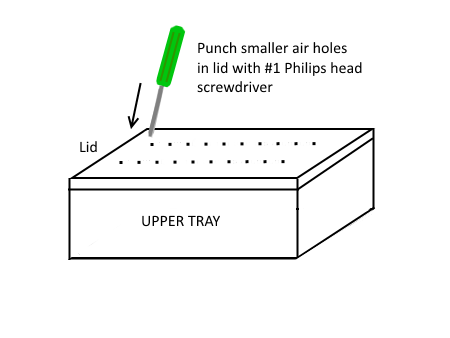 Take the lid, and using the #1 Philips head screwdriver, punch a two row of smaller air holes in the top of the lid. Punch the holes from the outside of the lid to the inside, so they’ll appear neater on the outside, as the foam breaks out a bit and looks messier on the exit side the screwdriver hole. Put the upper tray foam box and lid aside, the top half is now completed. Prepare your bedding material – if using a coconut coir block, soak it in a bucket of water until it is soft. 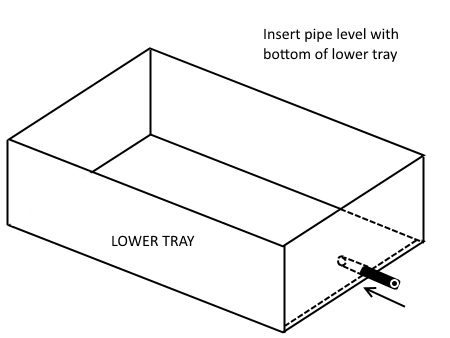 Take the other foam box for the lower tray, and on one side of the lower tray foam box, make a hole level with the bottom of the box and push the short section of black 12mm irrigation polypipe into it so it extends about 5cm (2”) inside the box. 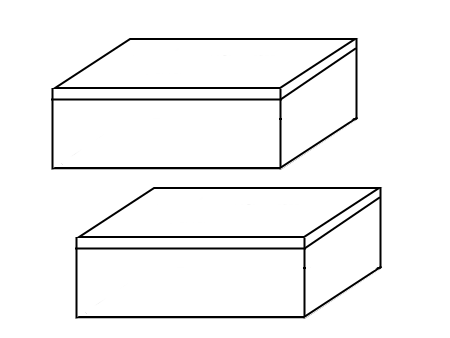 Sit the lower tray foam box on bricks or other supports so it is high enough to sit a small bucket under the drain pipe, and place the bucket underneath the drain. 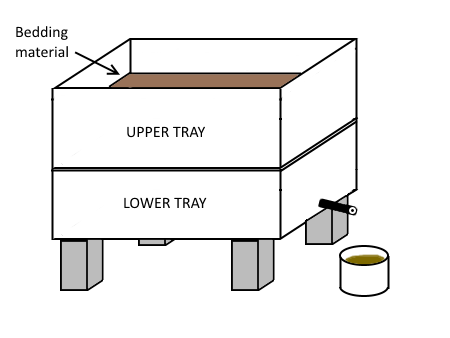 Sit the upper tray foam box on top of the lower one, and then pour in the coconut coir or other bedding material. 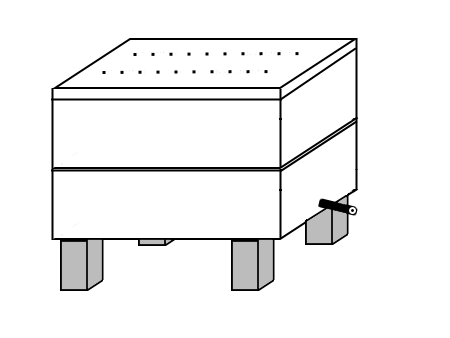 Any excess liquid will run into the lower tray and out of the drain pipe into the bucket. Add worms to the bedding, cover the bedding with a damp newspaper ‘worm blanket’ and put the lid back on. Congratulations on building your own worm farm! If you’d like to learn more about worm farms and how to care for them, check out our Worm Farming article. Nice article. Just two days back I built a similar kind of worm farm with broccoli boxes and I found this article today. I didnt use a clother underneath, but teared lots of newspaper and dipped in water and squeezed excess water out and to that added little shredded cardboard and dried leaves , all dipped and drained. Also I added little compost.. Will my babies like this bedding?? I am always worried about the moisture level of my bedding. How to know if my bedding’s dampness level is correct?? Will small ants in my farm hurt the worms? Your time and help would be greatly appreciated. If you have ants in your worm farm it is an indication that it is too dry. Ants do not like high moisture levels, and prefer dry places to live. You can buy shade cloth from your local hardware store. It was nice to read your article, it re-enforced that the way I am work my 2 worm farms is correct. I have to say I am pretty excited with the way the worms have multiplied and the amount of liquid gold and castings I am getting. Where can I get Broccoli boxes? From your local greengrocer, they have plenty. i hope your still watching this article, i am concerned about how toxic polystyrene boxes might be, they smell very strong….any thoughts or facts on this. Polystyrene (Styrofoam) is a technically expanded polystyrene foam, regular polystyrene is a common hard plastic used for CD cases and lots of plastics you find on appliances, etc. Polystyrene is a polymer of the styrene monomer, meaning styrene molecules are linked together to make polystyrene. While going into the technicalities of polystyrene foam toxicity is beyond the scope of this article and deserves an article of its own, I can say that Styrofoam (expanded polystyrene foam) under certain conditions leaches out styrene, a neurotoxic chemical which is also classified as a possible human carcinogen by the EPA and by the International Agency for Research on Cancer (IARC), it’s a compound that causes cancer in animals. The risk with Styrofoam is when it’s used in food containers, where it leaches out toxic styrene when in contact with hot, acidic or oily food or alcohol, causing a human health risk. Never microwave food in Styrofoam containers or eat oily food from them either, and don’t ever drink tea or coffee, fruit juice or alcoholic drinks from Styrofoam cups! Alcohol dissolves polystyrene foam to release toxic styrene. Thank you so much for sharing the article extract on styrene. It answered a lot of questions I had been mulling over.